Refugees: A half-hidden alternative world | The Forum Network, hosted by the OECD: Shape ideas. Shape policy. Shape the Future. Jonathan Wittenberg, Rabbi for the New North London Synagogue, describes his experiences with Refugees at Home, a charity based in the United Kingdom aiming to connect those with a spare room in their home with asylum seekers and refugees in need of accommodation. There are many things one knows in one’s head but not in one’s heart. I had been twice (briefly) to Calais and once to Lesbos. I had seen at first hand the flimsy remains of the dinghies used by thousands of families to cross the often dangerous waters between Turkey and Greece. I had picked up off the shore an orange life vest, only to be told by a rescue worker: "Undo the seams and look. That’s not a life but a death vest; the material inside is water-absorbent. It’s a fake sold by profiteers. Anyone who fell in the water with that would drown". But it was not until we began to host refugees in our house through Refugees at Home that I began to appreciate more deeply some of the enduring struggles so many people are forced to face. Refugees at Home asks families who have a room to spare to put up homeless refugees referred by Crisis or the Red Cross from anything between a few days and a few months. The first person to stay with us was a young man from the Sudan. Polite and modest to the point of self-effacement, he spoke hardly any English. He was only with us for five days. Each morning he went out, coming back in the evening. I guess he spent the days on the street. He would not take food for his lunch from us; I had to push something into his pocket. During his short stay I was away for one night for work. The shame I felt when I realised that I had packed for that day twice as much as our guest appeared to have in all the world is still with me. It seems unconscionable, unjustifiable that someone should be left with so little. The second person was a lady from Ethiopia. We were not planning to be home the night she was due to arrive. "What’ll happen if we can only offer a room from the following day?" my wife asked. "Don’t worry", she was told, "She’ll sleep on the night buses, or in the street". We made sure we were at home. One morning this kind and good lady, who showed us so much gratitude we were often embarrassed, came downstairs and told me her housing application had been rejected once again. “'Rejected'" she said, 'refused': it’s so hard after so many years. But," she said, drawing on her deep Christian faith, "I have to be patient". It was then that I asked her about her family. "My mother and brother were killed. I haven’t heard from my father for 12 years; he may be dead, or in prison". I realised then how little we know of the grief, anguish, terrors, traumas, longings and frustrated hopes which so many carry silently in their hearts. Our third guest is a young man from Iran; he has become almost part of the family. In fact, when we sat down with him to eat, he said: "I haven’t been with a family for a meal for four years". The other day I accompanied him to his Home Office interview; he is hoping to get permission to remain in the United Kingdom. A couple of days earlier, returning from another work trip to Berlin, I had casually put my passport down on the table. I have always taken having a passport for granted. But then I thought: I wonder what our guest will think when he sees that. What would he not give to have a passport to a free country, to a life, a home, a future? I recalled how once, when I was a child, my father could not find his passport. My parents turned half the house upside down to find it. I must have asked some foolish question about why such a very small book was so deeply important. "If ever you don’t have one, then you’ll understand", my father replied. He, like my mother, had been forced to flee Nazi Germany at the age of 16. He understood. Most of us are not in a position to issue refugees passports. But maybe we can offer them a roof over their heads, or food and some kindness, at least for a while, or moral support, on their arduous journeys in search of a life and a future. Help Refugees has established a pop-up shop in the heart of Soho during the Christmas shopping season. One can pay for coats, blankets, tents and other necessities for refugees; the organisation then ensures that such items are sent to the North of Greece or other camps where they are desperately needed. But the most stirring item for sale is a set of keys. They signify the hope of unlocking a path to a future. I was heckled at a recent meeting about helping refugees: "They’ll attack your children. They want all the wealthiest parts of London". The truth is that what the vast majority of refugees want is simple: the opportunity to create a new life for themselves and their families. No country can take everyone. The United Kingdom, like every European country, has millions of citizens struggling to make a living. Their needs are, or should be, an essential priority. But that is no excuse for being heartless or blind. Around us, far closer than we think, are people who have experienced traumas most of us can mercifully not even imagine: torture, flight, loved ones killed at their side. Helping at least some of them to build a future, learn a new language, find work and establish a home is not just important for them, but essential for the ethics and wellbeing of our own societies, too. History shows that immigrant groups, welcomed and well-integrated, have a lot to give. This is a humanitarian responsibility in which we, our communities and societies must engage. If we fail to do so, what is it that we are we saying about ourselves, and what will the future then hold? Jonathan Wittenberg was born in Glasgow to a German Jewish refugee family. After reading English at Cambridge and teacher training at Goldsmiths, he studied for the rabbinate at Leo Baeck College, London, and in Israel, following family tradition. 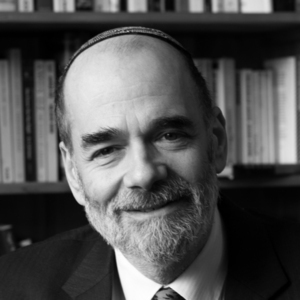 He was appointed Rabbi of the New North London Masorti Synagogue in 1987 and Senior Rabbi of the Assembly of Masorti Synagogues UK in 2008. He is a President of the Council of Christians and Jews and a member of the Council of Imams and Rabbis. He is a co-founder of Eco-Synagogue and deeply engaged in environmental issues. He is closely involved in supporting refugees. Further interests include pastoral work, hospice care, and literature, especially poetry. He teaches and speaks widely, including on Radio 4’s Prayer for the Day. His publications include The Eternal Journey: Meditations on the Jewish Year (2001); The Silence of Dark Water: An Inner Journey (2008); Walking with the Light (2013); My Dear Ones: One family and The Final Solution (2016) and most recently Things my dog has taught me – about being a better human. He is married to Nicola Solomon; they have three children and a dog. He loves plants, animals, people, and woodland and mountain walks.